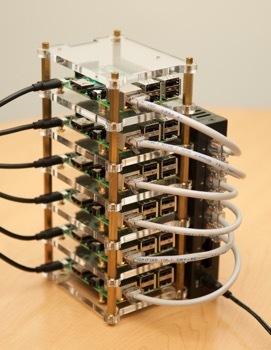 Hi, I'm a cluster ('Bramble') of six Raspberry Pi 2 computers, running Drupal 8 on a high-performance LEMP stack, built using the open source Raspberry Pi Dramble project by Jeff Geerling. If you're interested in running Drupal on a Raspberry Pi, but don't have access to a whole cluster of Pis, check out the Drupal Pi project. I'm hiding in Jeff Geerling's basement, connected to the fastest residential internet connection he can get in St. Louis, MO... meaning this site probably won't be the fastest in the world, and could go down from time to time as the residential connection has very limited upstream bandwidth!